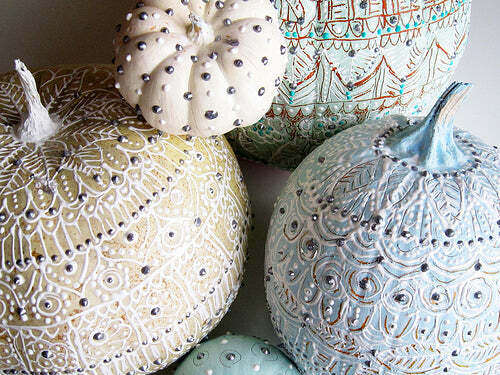 Pumpkin art - it's definitely a thing. And I'm not just talking about getting out the sharpest, scariest knife you have and carving the most intricate design you can find. Sure, your neighbors will be impressed but it's hardly worth it when it could cost you a trip to the emergency room to sew your finger back on. Things have evolved. Today, there's paint. There's glitter. There's decoupage. There's lace. You don't even have to cut it! I admit there's absolutely no shortage of pumpkin stuff circulating right now. But with my intense love of October, home decor, and all things Halloween, I couldn't help myself. So go ahead and let yourself be jealous of what these creatives have come up with. I know I am! I mean, who ARE these people? I want to know them for sure. 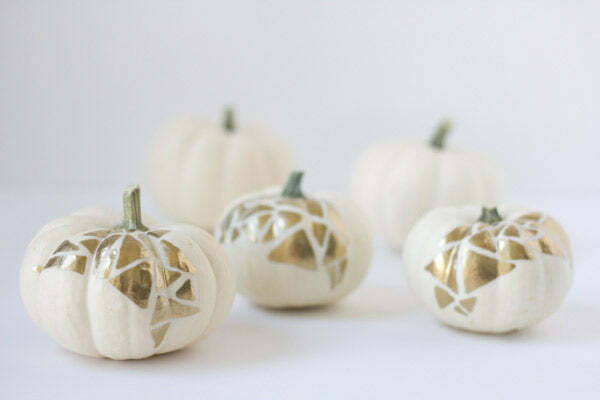 This gold-on-white geometric design is simple yet makes a bold, modern statement. These are great for apartment life, your cubicle at work, or even as wedding or party favors. Even if you're queen of #PinterestRegret or known for your #DIYfails, this one actually looks doable, right? Full DIY featured on Lovely Indeed. Now, we're taking it to another level. Decoupage. Such a fun word to say and even more fun to actually do. 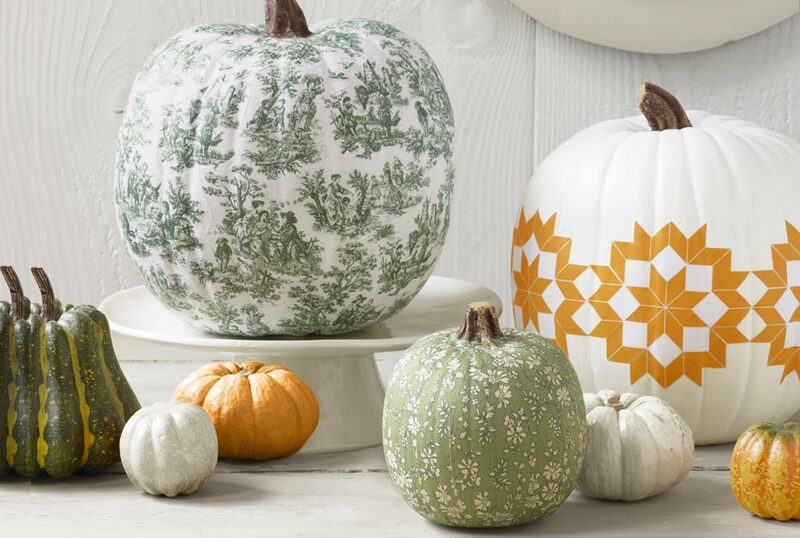 Give your pumpkin a look that coordinates with your home decor, making it well suited for indoors or outdoors. Tutorial from Country Living. 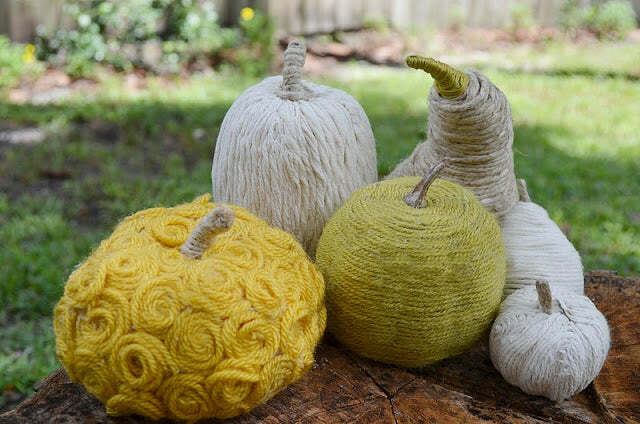 I'm SO smitten with these yarn-covered gourds, I can't even save the best for last. And do you see these marigold rosettes?! Dying right now. Another seemingly achievable project. Full instructions from Two Shades of Pink. Calling all artists. These require a little more of a design eye but go ahead, give it a shot. They're bright, bold, exciting and definitely make a statement! Can't get enough of this ikat print. DIY from Alisa Burke. It was only a matter of time until a Martha design made an appearance! 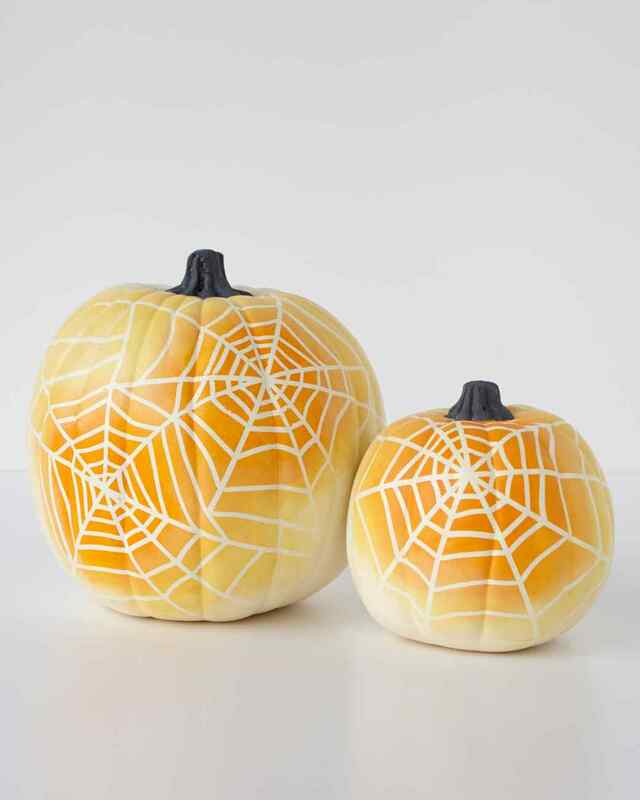 Can't resist these ombre spiderweb pumpkins. 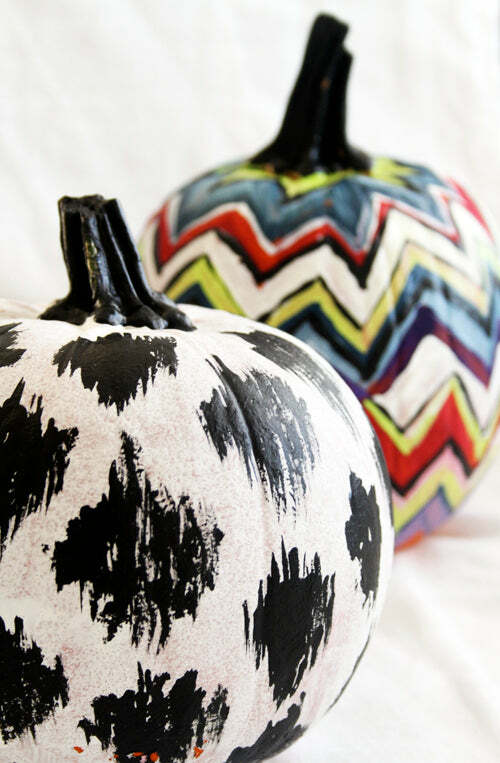 They're cheerful and welcoming while still being Halloween-inspired. Full instructions from Martha Stewart, image by Mike Krautter. And now for an easy one. Have some extra furniture nails you don't need? Why not create a design out of them. It's really THAT easy. Full DIY from Lovely Indeed. Maybe you don't have furniture nails and don't feel like getting lost in Home Depot. But, you're at the office and have tons of paper brads and push pins. Go for it! And kid-friendly too! Instructions from A Subtle Revelry. Could this be any cuter? 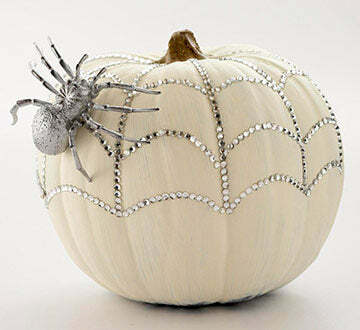 An element of traditional Halloween spooky with tons of glam. And of course, I adore the neutrals. The how-to from Better Homes & Garden. 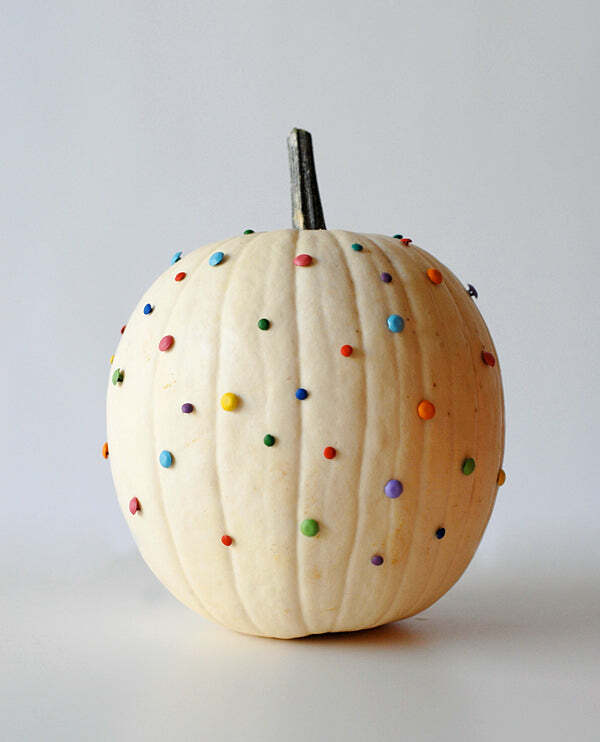 And last but definitely not least, the puffy paint pumpkin. This looks to be at the expert level but if you're feeling adventurous, have at it. Complete DYI by the super talented Alisa Burke. Feeling inspired? 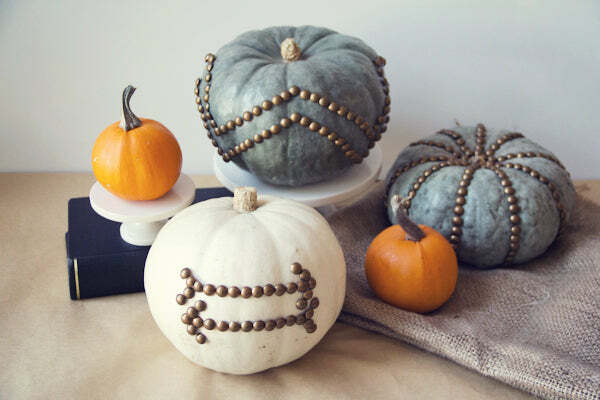 Still plenty of time before Halloween to make one of these happen. Good luck! Make sure to stay tuned to the blog for even more inspiration!